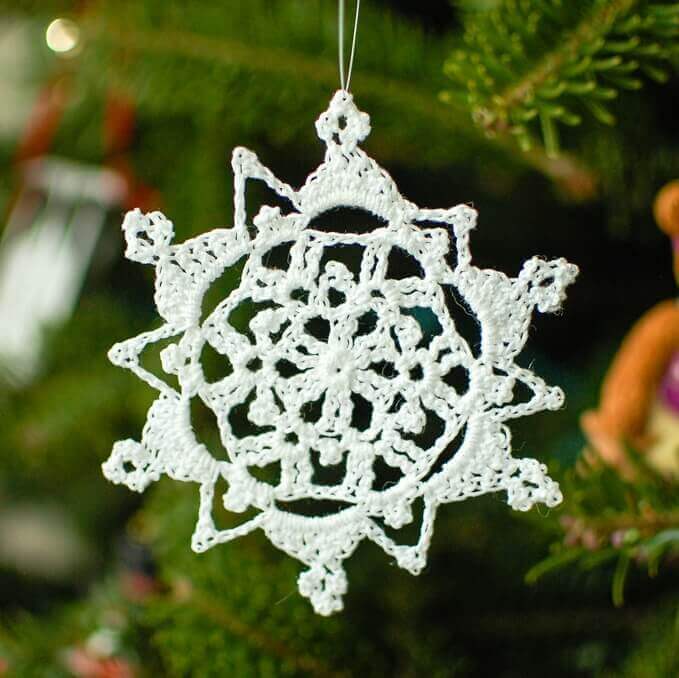 Although this Pretty Picot Snowflake Pattern is only 5 rounds the design appears to be much more intricate. My favorite part of this snowflake is the alternating triangular and picot points. 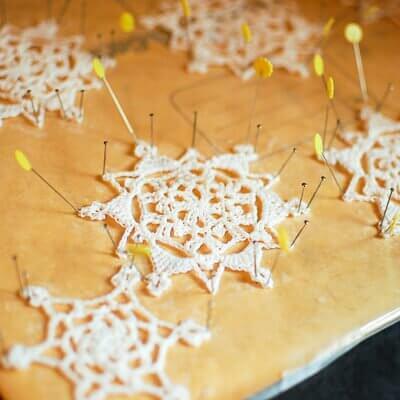 This is the larger of the lacy snowflakes in the 4 snowflake designs I recently shared with you and pairs especially nicely with thie Dainty Lace Snowflake pattern. Make up a bunch to decorate your home, hang in your window, or dress your Christmas tree … they are also great to top off a gift! Scroll down for this free pattern or get it as part of a Set of 4 Snowflake Patterns eBook, a convenient ad-free pdf download for purchase here in my shop or here on Ravelry. Picot (p): Chain 3, work 1 single crochet in first chain made. Triple picot (tr-p): Work 3 picots, slip stitch into base of first picot made. Finished snowflake measures approx 4 in. Ch 5 (counts as ch 1 and 1st tr). Round 1: Work 1 tr in furthest chain from hook, ch 3, *2 tr in same ch as last stitch was made, ch 3, rep from * 4 more times, join in top of beg ch — 12 tr sts. Round 2: Sl st in next tr, *[1 sc, ch 4, 1 sc] in next ch-3 sp, ch 1, p, ch 1, rep from * 5 more times, join in 1st sc — 12 ch-4 loops. Round 3: Sl st in next ch-4 sp, ch 4 (counts as tr), [1 tr, ch 3, 2 tr] in same ch-4 sp, ch 3, *[2 tr, ch 3, 2 tr] in next ch-4 sp, ch 3, rep from * 4 more times, join in beg ch 4 — 12 ch-3 loops. Round 4: Sl st in next tr, *[2 sc, p, 2 sc] in next ch-3 sp, ch 7, skip next ch-3 sp, rep from * 5 more times, join in 1st sc — 6 ch-8 sp. Round 5: *Ch 3, p, ch 3, [1 sc, 1 hdc, 2 dc, 1 tr, tr-p, 1 tr, 2 dc, 1 hdc, 1 sc] in next ch-7 sp, rep from * 5 more times, Sl st around beg ch 3 — 12 p points. What is the starting process….magic circle? Crochet ? stitches and slip stitch together???? Elegant and very beautiful ! This is so beautiful…and you included the pattern! Yay! I have been looking for a lovely pattern for a snowflake. Thank you. So delicate and beautiful! Thank you for sharing the pattern. Just beautiful! I love how vintage-y the snowflake looks. And I LOVE how it looks so delicate and lacy. Great job! Beautiful …love them,just got a snowflake book from my friend as a Christmas gift and it’s beautiful and it has great patterns . Yours are cute …next November I will start making some for Christmas. Happy New Year and happy crocheting ! I really neet to learn how to crochet with that teeny-tiny hook and thread…I’m all thumbs!! Really cute snowflake. Thanks for sharing! Hope to see you in my new blog: Lanas de Ana. Beautiful snowflake – thanks for sharing your pattern.